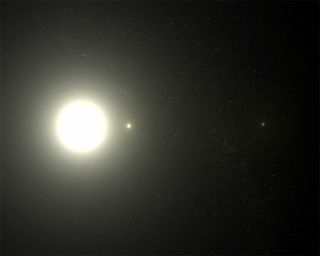 The North Star, Polaris, is depicted as a triple star system in this artist’s conception, based on images taken with the Hubble Space Telescope. If you went out on the street and ask people at random what the brightest star in the sky was, odds are a majority would say, "The North Star!" It appears that most people arbitrarily figure that the most important star in the sky should also be the brightest, but in truth, the North Star, which goes by the name of Polaris, is a star of only medium brightness. In terms of overall rank there are quite a few stars brighter than Polaris. In fact, Polaris doesn't even crack the top 40; it's number 48 on the list of brightest stars. The reason Polaris is so important is because the axis of Earth is pointed almost directly at it. During the course of the night, Polaris does not rise or set, but remains in very nearly the same spot above the northern horizon year-round while the other stars circle around it. So at any hour of the night, at any time of the year in the Northern Hemisphere, you can readily find Polaris and it is always found in a due northerly direction. If you were at the North Pole, the North Star would be directly overhead. That's true now, anyway. But Polaris won't always be the North Star. Read on. Polaris is a Cepheid variable, meaning that it has a regular cycle of brightening and dimming, similar to other stars of its type. However, it has been getting brighter during the past couple of decades, for reasons that are still poorly understood. While the star is still relatively dim, as of 2014 a group of scientists estimated that Polaris could be about 4.6 times brighter today than it was in ancient times. A minor meteor shower known as the Camelopardalids – which streaks from a location near Polaris – occasionally produces good shows. The shower was first recorded in 2014, when Earth plowed through the debris stream of Comet 209P/LINEAR for the first time. While the first show ended up being a bust, a relatively strong meteor shower was reported in 2016. In 2008, NASA beamed the Beatles song "Across the Universe" to the North Star, in honor of several anniversaries – the 50th anniversary of NASA, the 50th anniversary of Explorer 1 (the first U.S. satellite), the 45th anniversary of the Deep Space Network (which receives signals from deep-space probes such as Voyager) and the 40th anniversary of the recording of the song itself. Polaris is located in the constellation of Ursa Minor, the Little Bear. It sometimes also goes by the name "Stella Polaris." The seven stars from which we derive a bear are also known as the Little Dipper. Polaris, the North Star, lies at the end of the handle of the Little Dipper, whose stars are rather faint. Its four faintest stars can be blotted out with very little moonlight or street lighting. The best way to find your way to Polaris is to use the so-called "Pointer" stars in the bowl of the Big Dipper, Dubhe and Merak. Just draw a line between these two stars and extend it out about 5 times, and you eventually will arrive in the vicinity of Polaris. Interestingly, the Big and Little Dippers are arranged so that when one is upright, the other is upside down. In addition, their handles appear to extend in opposite directions. Of course, the Big Dipper is by far the brighter of the two, appearing as a long-handled pan, while the Little Dipper resembles a dim ladle. Polaris is located at a distance of 434 light-years from Earth and has luminosity nearly 4,000 times that of our sun. Polaris shines at 2nd magnitude. On this astronomers' scale, smaller numbers represent brighter objects, with the brightest stars and planets in the night sky at around magnitude zero or even negative magnitudes. The North Star it is a "pulsing" star, a Cepheid variable, which appears to vary in brightness ever so slightly – only one tenth of a magnitude – over a time frame of just under four days. If you have a small telescope and train it on Polaris, you just might notice a tiny companion star (called Polaris B) shining at 9th magnitude with a pale bluish tint. This companion was first sighted by Sir William Herschel in 1780 (just a year later, Herschel would discover the planet Uranus). Astronomers believe that the two stars – A and B – are separated by about 2,400 astronomical units – one astronomical unit (a.u.) being the average distance of the sun to the Earth. The orbital period of the two stars may number in the many thousands of years. In 1929, by studying the spectrum of Polaris, a third companion star (Polaris C) was discovered. This one, a white dwarf, lies only 18.5 a.u. from Polaris A (about the same distance of the planet Uranus from our sun). Its extreme closeness to the far more brilliant Polaris A explains why it went unseen for so long. Exactly where you see Polaris in your northern sky depends on your latitude. From New York it stands 41 degrees above the northern horizon, which also corresponds to the latitude of New York. Since 10 degrees is roughly equal to your clenched fist held at arm's length, from New York Polaris would appear to stand about "four fists" above the northern horizon. At the North Pole, you would find it overhead. At the equator, Polaris would appear to sit right on the horizon. So if you travel to the north, the North Star climbs progressively higher the farther north you go. When you head south, the star drops lower and ultimately disappears once you cross the equator and head into the Southern Hemisphere. And always keep this fact in mind: Polaris is more accurate than any compass. A compass is subject to periodic variations and can only show you the direction of the lines of the strongest magnetic force for a particular spot and for a particular time. But even Polaris isn't positioned exactly due north. Only about 0.7 degree separates Polaris from the pivot point directly in the north – called the North Celestial Pole – around which the stars go daily. In case you're wondering, 0.7 degree amounts to less than the apparent width of 1½ full moons. Aside from the North Star the two stars at the front of the Little Dipper's bowl are the only ones readily seen. These two are often referred to as the "Guardians of the Pole" because they appear to march around Polaris like sentries; the nearest conspicuously bright stars to the celestial pole except for Polaris itself. Columbus mentioned these stars in the log of his famous journey across the ocean and many other navigators have found them useful in measuring the hour of the night and their place upon the sea by their position relative to Polaris. The brightest Guardian is Kochab, a second magnitude star with an orange hue. The other Guardian goes by an old Arabian name, Pherkad – the "Dim One of the Two Calves." Pherkad is indeed dimmer than Kochab, shining at third magnitude. There is a famous Shakespeare quote that has Julius Caesar stating, "I am constant as the northern star." But in reality, Polaris is not really constant, at least over a time span measured over centuries, for it will not always be our North Star. Like a spinning top that wobbles due to a force called torque, our spinning earth is also subject to torque that is caused by the gravitational forces of the sun and moon. As a result the earth's axis wobbles (called precession), and as a consequence describes a circle in the sky; the gradual change in the direction of the earth's axis in space. So the north celestial pole shifts as the centuries go by. Polaris is actually still drawing closer to the pole and on March 24, 2100, it will be as close to it as it ever will come, just 27.15 arc-minutes or slightly less than the moon's apparent diameter. Since it takes about 25,800 years for the Earth's axis to complete a single wobble, different stars have become the North Star at different times. For example, the star Thuban in the constellation of Draco, the Dragon, was the North Star around the year 2600 B.C., during the age of the Pyramid builders of ancient Egypt. The brightest Guardian, Kochab, was the North Star at the time of Plato, around 400 B.C. And around the year A.D. 14,000, Earth's axis will point reasonably close to the star Vega, one of the brightest stars in the sky; perhaps our future descendants will confer the title of North Star on it.